The american satellites of DMSP (Defense Meteorological Satellite Program) scan the lights of the Earth at night. 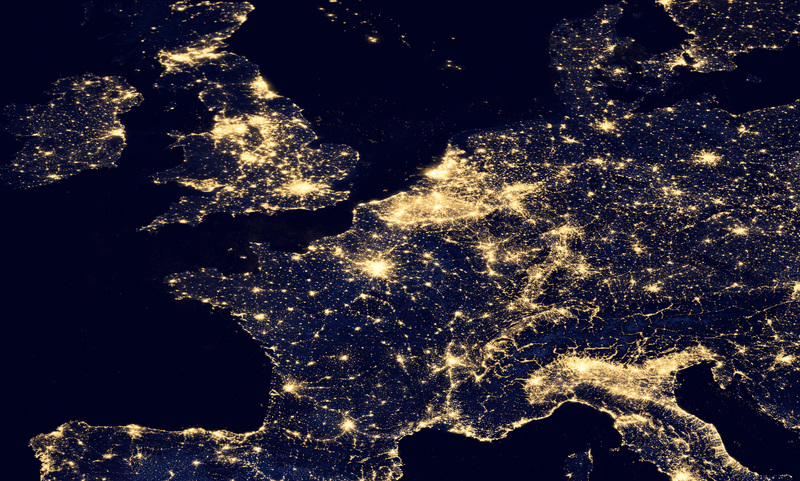 Such measurements were used to create the fascinating map with artificial light of the Earth. 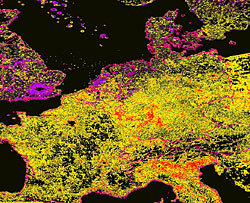 In February 2010 the 4th version for the years 1992-2008 from different satellites was available. Unfortunately the sensitivity of the detectors of the different satellites but also during the different years varied. Therefore the data from 2008 seem to be fainter than those of 2004. An intercalibration like done by Elvige et al. (› article) was not yet possible. 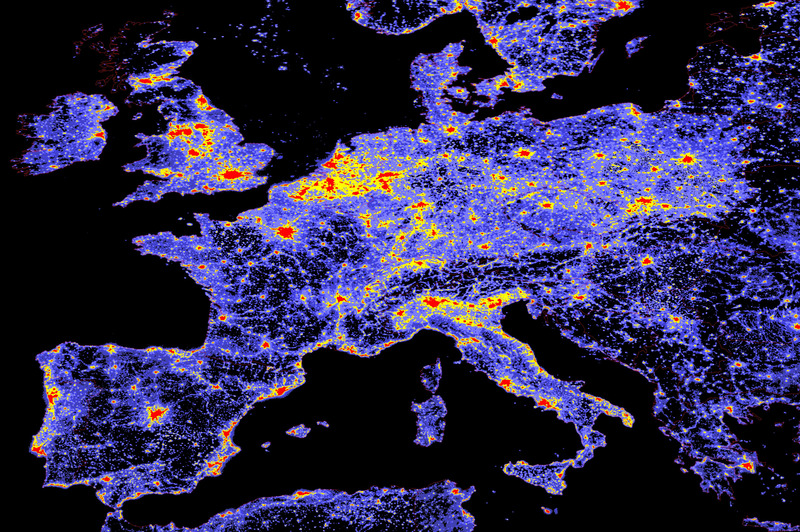 Nevertheless changes, especially close to the cities, can be detected. 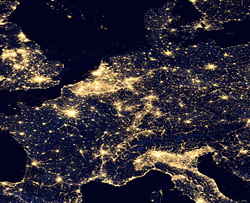 In 2011 the Suomi National Polar-orbiting Partnership-Satellite was launched with the new VIIRS radiometer which delivers high resolution and dynamic night pictures of the Earth. Red an even higher increase. Pink and blue shows a decrease. The decrease in some regions of the Netherlands can be explained with the enormous areas of illuminated greenhouses, that are allowed to switched on only during certain time, in 1993 they were swithced on, but in 2002 off. 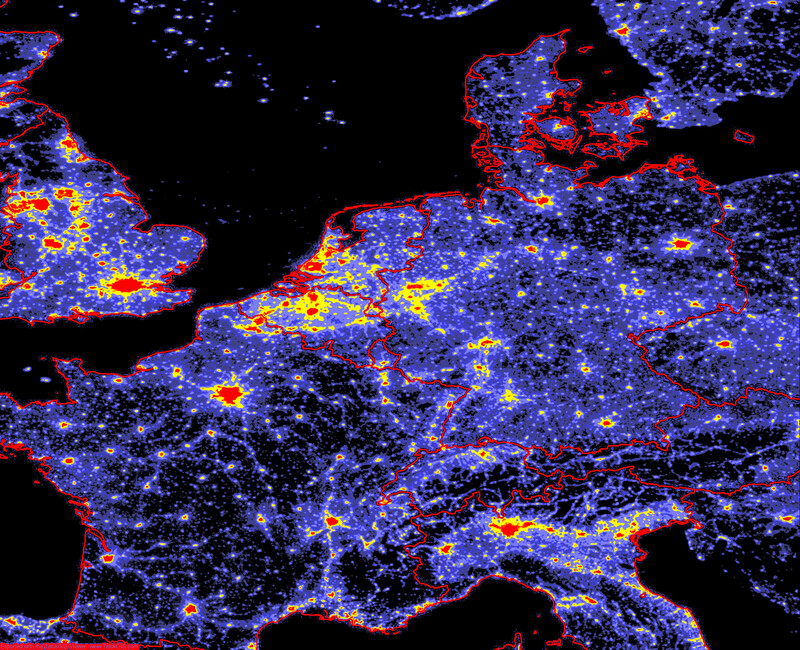 Why the light around London has been decreased is unknown, it might be an instrumental effect. Pixel size is 0,5', corresponding to 0,6 km x 1 km in central Europe. These maps show only the upward lights, that the satellites measure. In fact, light is scattered in the atmosphere, which results in the fact that fainter stars are not visible. 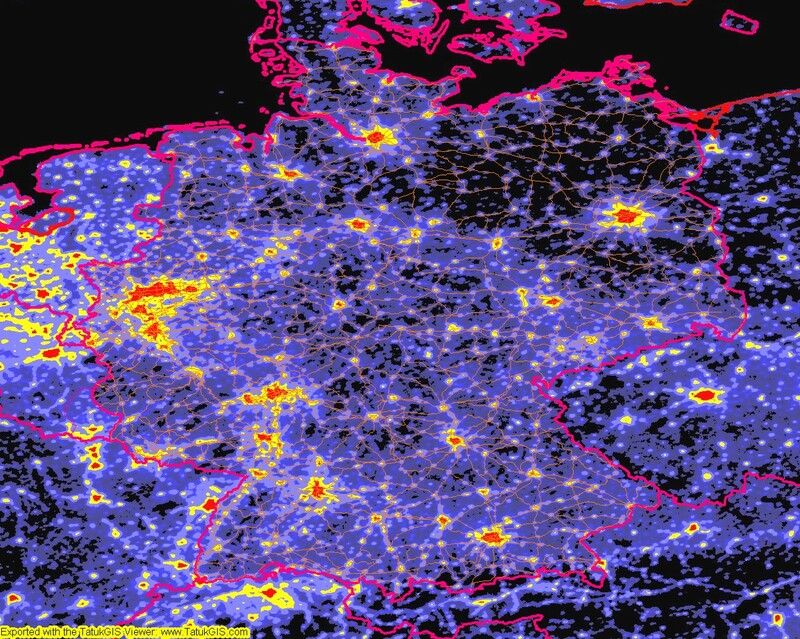 This has been modelled in the first world atlas of light pollution by Pierantonio Cinzano, calibrated in sky background brightness in mag/arcsec2. The maps of Frederic Tapissier have a high resolution, but they are based on data for cities and commercial areas, to which he has attributed a certain brightness, and afterwards smeared to model light propagation in the atmosphere. Light pollution map for central Europe for the year 2008. 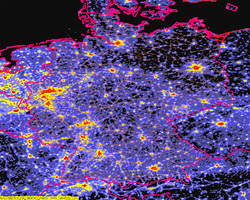 Streets have been overlayed on this map of germany for 2008 (right), to facilate orientation. Users of moving map software (Fugawi, OziExplorer, Touratech) can use the georeferenced map and with a GPS the actual position can be shown. The extreme increase of upward light is not necessary due to an increase of the amount of light. It might also be increased sensitivity of the detectors of the new satellite. Sky background brightness in Vmag/arcsec (from Cinzano) for central Europe. This can be compared with brightness measurements made with the Sky Quality Meter. The maps were taken from www.lightpollution.it, there can also be found a more detailed description (white >21.5, green 21-21.5, dark green 20.5-21, kaki 20-20.5, yellow 19.5-20, dark yellow 19-19.5, pink 18.5-19, orange 18-18.5, maroon 17.5-18, dark red <17.5 mag/arcsec2). The difference of the DMSP-satellite-data from 2002-1993 (1.4 MB), the colour scale is described above! By this way everybody in central Europe has the possibilty to compare the different data with his own observing experiences! 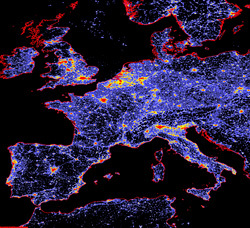 You can't acces the files at the moment directly from GoogleEarth, you have to open them with a file manager (eg. 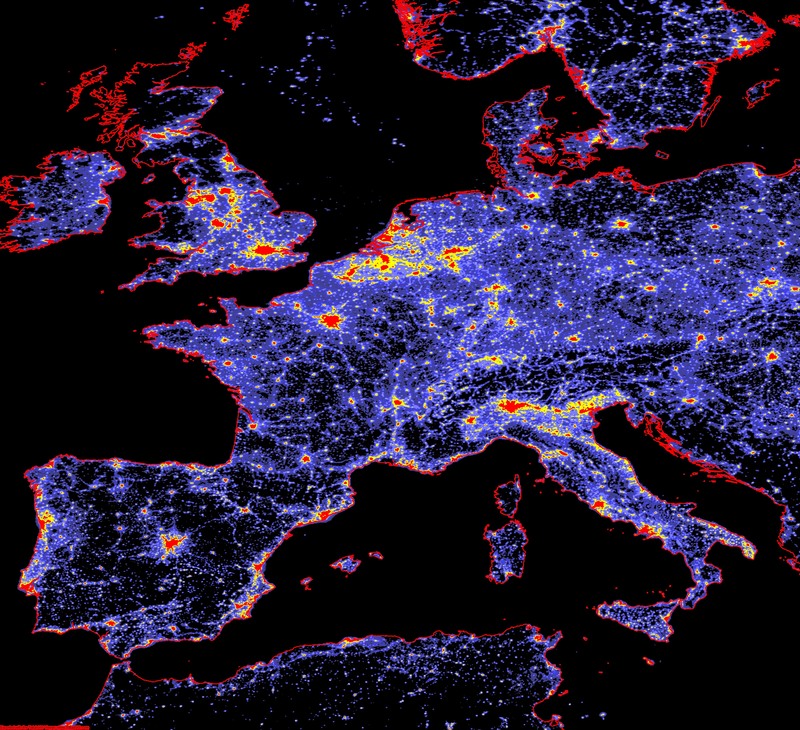 ES File Explorer), then they are displayed in GoogleEarth.